Heart surgery in children is done to repair heart defects a child is born with (congenital heart defects) and heart diseases a child gets after birth that need surgery. The surgery is needed for the child's wellbeing. There are many kinds of heart defects. Some are minor, and others are more serious. Defects can occur inside the heart or in the large blood vessels outside the heart. Some heart defects may need surgery right after the baby is born. For others, your child may be able to safely wait for months or years to have surgery. One surgery may be enough to repair the heart defect, but sometimes a series of procedures is needed. Three different techniques for fixing congenital defects of the heart in children are described below. Open-heart surgery is when the surgeon uses a heart-lung bypass machine. An incision is made through the breastbone (sternum) while the child is under general anesthesia (the child is asleep and pain free). Tubes are used to re-route the blood through a special pump called a heart-lung bypass machine. This machine adds oxygen to the blood and keeps the blood warm and moving through the rest of the body while the surgeon is repairing the heart. Using the machine allows the heart to be stopped. Stopping the heart makes it possible to repair the heart muscle itself, the heart valves, or the blood vessels outside the heart. After the repair is done, the heart is started again, and the machine is removed. The breastbone and the skin incision are then closed. 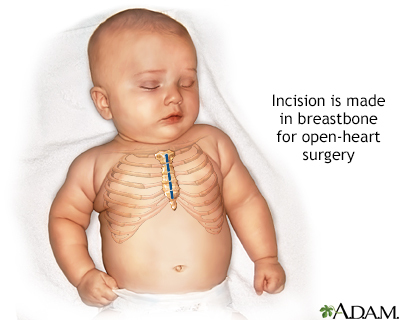 For some heart defect repairs, the incision is made on the side of the chest, between the ribs. This is called a thoracotomy. It is sometimes called closed-heart surgery. This surgery may be done using special instruments and a camera. Another way to fix defects in the heart is to insert small tubes into an artery in the leg and pass them up to the heart. Only some heart defects can be repaired this way. A related topic is congenital heart defect corrective surgeries. Some heart defects need repair soon after birth. For others, it is better to wait months or years. Certain heart defects may not need to be repaired. Blue or gray skin, lips, and nail beds (cyanosis). These symptoms mean there is not enough oxygen in the blood (hypoxia). Hospitals and medical centers that perform heart surgery on children have surgeons, nurses, and technicians who are specially trained to perform these surgeries. They also have staff that will take care of your child after surgery. If your child is talking, tell them about the surgery. If you have a preschool-aged child, tell them the day before what will happen. Say, for example, "We are going to the hospital to stay for a few days. The doctor is going to do an operation on your heart to make it work better." If your child is older, start talking about the procedure 1 week before the surgery. You should involve the child's life specialist (someone who helps children and their families during times like major surgery) and show the child the hospital and surgical areas. Always tell your child's health care provider what medicines your child is taking. Include drugs, herbs, and vitamins you bought without a prescription. If your child is taking blood thinners (drugs that make it hard for blood to clot), such as warfarin (Coumadin) or heparin, talk with your child's provider about when to stop giving these drugs to the child. Your child will most often be asked not to drink or eat anything after midnight the night before the surgery. Most children who have open-heart surgery need to stay in the intensive care unit (ICU) for 2 to 4 days right after surgery. They most often stay in the hospital for 5 to 7 more days after they leave the ICU. Stays in the intensive care unit and the hospital are often shorter for people who have closed-heart surgery. A tube in the airway (endotracheal tube) and a respirator to help with breathing. Your child will be kept sleeping (sedated) while on the respirator. One or more small tubes in a vein (IV line) to give fluids and medicines. A small tube in an artery (arterial line). One or 2 chest tubes to drain air, blood, and fluid from the chest cavity. A tube through the nose into the stomach (nasogastric tube) to empty the stomach and deliver medicines and feedings for several days. Many electrical lines and tubes used to monitor the child. By the time your child leaves the ICU, most of the tubes and wires will be removed. Your child will be encouraged to start many of their regular daily activities. Some children may begin eating or drinking on their own within 1 or 2 days, but others may take longer. When your child is discharged from the hospital, parents and caregivers are taught what activities are okay for their child to do, how to care for the incision(s), and how to give medicines their child may need. Your child needs at least several more weeks at home to recover. Talk with your provider about when your child can return to school or day care. Your child will need follow-up visits with a cardiologist (heart doctor) every 6 to 12 months. Your child may need to take antibiotics before going to the dentist for teeth cleaning or other dental procedures, to prevent serious heart infections. Ask the cardiologist if this is necessary. The outcome of heart surgery depends on the child's condition, the type of defect, and the type of surgery that was done. Many children recover completely and lead normal, active lives. Ginther RM, Forbess JM. Pediatric cardiopulmonary bypass. In: Fuhrman BP, Zimmerman JJ, eds. Pediatric Critical Care. 5th ed. Philadelphia, PA: Elsevier; 2017:chap 37. LeRoy S, Elixson EM, O’Brien P, et al. Recommendations for preparing children and adolescents for invasive cardiac procedures: a statement from the American Heart Association Pediatric Nursing Subcommittee of the Council on Cardiovascular Nursing in collaboration with the Council on Cardiovascular Diseases of the Young. Circulation. 2003;108(20):2550-2564. PMID: 14623793 www.ncbi.nlm.nih.gov/pubmed/14623793. During open-heart surgery an incision is made through the breastbone (sternum) while the child is under general anesthesia.